– Exhibited at Open Space, Vienna. – Simultaneous presentation of the videos will be in Erste Bank’s Lobby, Vienna. Visitors to the Erste Bank will have the opportunity to see a selection of films on the upper floor of the banking building, making the interior of the bank to interact iwth (im)migrants with(in) videos. Due to the current world crisis, we are living in a time of dramatic changes, wherein the conventional notion of “country” and the established state power, modifies itself and results in the re-shifting of social, governmental and economic priorities. The conventionally most powerful (or capitalist) countries are facing economic downfall, resulting from the general panic due to individual loss: loss of property, jobs, stability, etc. The first in line to be “swept away”, as a result of this crisis, are people who are marginalised – whether economically, ethnically or religiously – the people who are, in a certain way, alienated from the system they inhabit. Societies non-acceptance of (im)migrants, has resulted with the social isolation, or invisibility of this marginalised group of individuals. A strong reaction to this situation is noticeable in artistic production, especially through the socially/politically engaged practices of recent years, in the form of protectiveness toward alienated, or otherwise displaced groups of individuals in society. One could ask – what causes this artistic reaction? Is it a set of new governmental legislations? Or, are the artists reacting to the unwritten/unlegislated rules that haunt and humiliate this group of “stateless subjects”, on a daily basis? In his book, “State of Exception”, Giorgio Agamben points out that the state of exception is not a specific kind of law; rather it is a suspension of the juridical order itself, it defines law’s threshold or limit concept[*]. This exhibition, (im)migrants with(in), uses the notion of the “threshold of law” to describe a “ghost town” or a “black hole”, wherein laws and legislations are freely interpreted in order to undermine, devalue, isolate and alienate groups of marginalised people in society. The exhibition aims, through examples of the artistic response to this established situation in contemporary society, defined by the afore-mentioned “threshold of law”, to give a voice (at times, even a singing/shouting voice) to this group of “invisible people”. The work represented at Open Space is solely video work, focusing on two different artistic approaches: firstly, the documentary, where the life stories of the ‘aliens’ are told from the position of a “first person” narration (Ostojić/Rych, Ramadan); and secondly, the methodology used by artists for the re-appropriation of facts and documents by creating independent scenarios (Castro/Ölafsson, Lim). Those two different modes of expression within the video medium, have led this exhibition to make an investigation of the medium of the video itself. In other words, it leads the exhibition to test the importance of the representation of reality within it, by questioning the degree to which documentary practices could/should activate additional scenarios and individual interpretations of reality. This issue and other related research questions will be debated during the discussion, which starts at 5pm in Open Space, followed by the Opening Reception. [*] State of Exception, Giorgio Agamben, University of Chicago Press, Chicago&London, 2005, pp. 4. In the video Caregivers, Castro and Ólafsson, using different forms of expression, introduce questions addressing European social issues and contemporary politics. 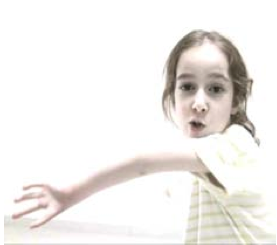 As the backbone for this video, the artists use (pop)music video culture, but their investigations into other visual and contextual forms of expression, is furthered by their interest and refer- ence to contemporary classical music, contemporary choir singing, as well as the narrative content conveyed through these forms of expression. ‘Caregivers’ was commissioned for the Principle Hope exhibition curated by Adam Budak, for Manifesta 7, exhibited in Manifattura Tabbacci in Rovereto, Italy. 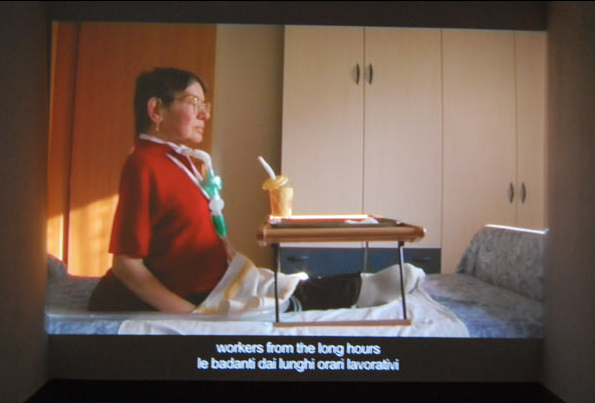 The video portrays two migrant care-givers (one from the Ukraine and the other from Romania) engaging with their elderly clients in and around the area of Rovereto; the video illustrates their relationship with their clients and the nature of their daily work. Images of the sleepy Italian city and images of a contemporary choir performing, are juxtaposed with touching images of the care given by the migrant women. The nar- rative content of the contemporary classical piece being performed, was taken by the artists from newspaper articles that illustrate various facts about labor migration. In this video, the artists give a voice to the sup- pressed group of migrated people, and the description of their situation of ‘enslavement’, through the selection of newspaper journals found by the artists on the internet. More importantly for the (im)migrants with(in) exhibition and the con- cept of the ‘threshold of the law’, the words that are sung by the choir in the video‘Caregivers’, describe the implications of the European legisla- tions and the misuse of human rights, when legislations are applied to the realities of the everyday. Libia Castro and Ólafur Ólafsson (based in Rotterdam and Berlin) started their collaboration during their post-graduate studies in Visual Arts in The Netherlands in 1997. In their work, whether experiential installation environments, interventions, events, sculpture, video- or photo-works, Libia and Ólafur often collaborate with other people: groups, individu- als, activists, artists and other professionals. Their work developed under the influence of Conceptual Art and art movements such as Fluxus, Arte Povera, Social Sculpture and Neo-Concretism. While reflecting upon everyday life in the different places in which they work, they wish to sen- sitize the perception of their viewers, raising questions about the human condition, focusing on existential, spatial, cultural, socio-economic and political aspects. They have participated in Manifesta 7, and exhibited at Reykjavik Art Museum, Akureyri Art Museum, CAC Málaga, CAC Vilnius, Art in General New York, De Appel CAC Amsterdam, Rotor Graz, Witte de With CAC Rotterdam, TENT Rotterdam, Kunstler Haus Bethanien Berlin, Platform Garanti CAC Istanbul, Van Abbe Museum Enschede, and the 8th Havana Biennial. They are currently shortlisted for the Prix de Rome 2009, in the Netherlands. In the video New Town Ghost, Lim takes an active position towards the ab- surdities and problems resulting from the thoughtless development and com- mercially driven landscapes of our society. 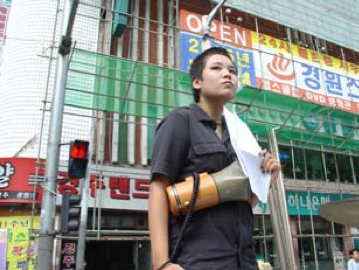 The video follows a young woman slammer and a drummer who travel and perform on top of an open truck as it drives through the busy and cramped streets of Yeongdeungpo. An area in Seoul that has gone through an intense redevelopment plan, Yeongdeungpo has become a symbol for Minouk Lim, as it has for other Koreans of her genera- tion. A major manufacturing and industrial hub during the past century, this area has now become one of the city’s ‘new towns’, experiencing drastic and continuous change. In the video, the truck with its performers, follows a specific route around a triangle of the Yeongdeungpo area that has been redeveloped, while also driv- ing into adjacent areas that remain untouched by the surge of redevelopment. Through a megaphone, the slammer recites a text/poem written by the artist. The poem comments on the new local mall and housing complex, as well as on the new-knowledge economy. Through this bold action, the performance aims / hopes to provoke a reaction from the local population that has inhabited the ‘threshold of the law’ for years. In Minouk Lim’s New Town Ghost, in contrast to Castro and Ólafsson’s video Caregivers, we do not encounter ‘stateless subjects’. Instead, we are meeting cit- izens who have, in a similar manner, been forced to migrate within their own city and country, due to the economical injustices fortified by the developing society. The significance of this video is that it breaks the stigmatism that victimisation happens only within transnational communities. Perhaps even more significantly, this video is a direct reaction to specific transformations in the way a society functions, in the attempt to alter and affect the viewers’ perception and awareness of the codes of life around us. Minouk Lim (based in Seoul), works both alone and as a member of collabora- tive practice (most notably, with the Pidgin Collective). Her work expands the boundaries and possibilities of the art system, giving emphasis to the conditions and context within which works are produced. Most of the projects function as a response to, or an interpretation of, a specific situation and/or invitation. (2008); Isola Art Center, Milano, Italy; Museo Nacional de Bellas Artes, Buenos Aires. In 2007: Tina.B,_The Prague Contemporary Art Festival, Prague; 10th International Istanbul Biennial, Turkey; 6th Gwangju Biennale, The Last Chap- ter, “Trace Route”, Gwangju, Korea; Museo de Arte Contemporáneo, Santiago, Chile; An Atlas of Events, Fundação Calouste Gulbenkian, Lisbon; etc. The video Sans Papiers portrays one of the major deportation jails in Germany (Berlin-Köpenick). This video introduces the viewers to the shocking realities, conditions and treatment that illegal citizens receive, upon being caught in- between the law and bureaucratic system. In their documentary, Ostojić /Rych decribe the shocking position of unwant- ed aliens, thereby directly illustrating the concept of ‘threshold of the law’: ‘… EU state governments do everything to give as little asylum as possible. Refugees are deported and removed, and pushed over EU borders to fend for themselves….Most rejected asylum-seekers cannot be expelled due to civil wars raging in their home countries, or complicated cases of “non-confirmed” identity, but are still kept in prison for one to six months with a maximum of eighteen months, while being billed for their stay – an average of 65 Euros per day. I got this information from a number of talks with activists and based on a number of resource materials received as part of the Initiative against Deporta- tion, and press clippings and research conducted by doctoral students of Prof Dr Klaus Gerd Giesen, Theory of Law, University of Leipzig. of the recipient. David Rych, (based in Berlin), is an artist and filmmaker. He studied at the University of Innsbruck, Academy of Fine Arts in Vienna and Bezalel University in Jerusalem. 2008 Video, 20 min., colour, sound, loop, DVD Pal English / no subtitles. In one of his writings, Ramadan points out that: ‘… in the disembodied world of the virtual community, identity is also ambiguous…’. In relation to the destiny of the group of people that ‘inhabit’ the video A Look Back, one could ask the following: These individuals are of Lebanese origin, holders of Western passports, which allows them to move freely, including the possibility of escap- ing from a situation of war…. Is the national identity of those people therefore ambiguous? Methodologically different to the other videos in this exhibition, in which the victims are easily recognizable (they are either victims of physical displace- ment, economical injustice, etc), this video confuses us, as viewers. Here we deal with the victims of a bombing; however at the same time, we follow a privileged group of individuals, who have the possibility of avoiding war (as all of them did, fleeing from Lebanon to their countries of residence after the turbulent experience of a bombing). Is the (im)migrant always a direct victim of economic, religious or political suppression – and what happens if he/she is not? Would we still be able to define the people from this video as part of a group of ‘marginalized’ individuals and ‘place’ them within the ‘threshold of the law’. In my own opinion, these individuals are victims of their own ‘ambiguous identity’, the identity that most of us – as transnationals, or citizens with dual, or even triple nationalities /citizenships – live with. This form of identity gives us a freedom, but also removes the possibility of belonging, which likewise represents a limitation. Khaled D. Ramadan (based in Copenhagen) is a video maker, art historian, a writer and lecturer in new media. His fields of specialty are visual culture and aesthetics, including multiculturalism and gender, with diverse interests in the fields of social history, scientific research and critical theory, which have greatly influenced his work. He has published several articles and books, the latest being Peripheral Insider, Museum Tusculanum Press, Copenhagen University 2007. He has curated exhibitions, film and video festivals, and is the founder of the MidEast Cut; Made in Video Festival for the Film Institute in Copenhagen; the Coding-Decoding documentary festival at Nikolaj Copenhagen Art Center, and at the Museum for Contemporary Art, Roskilde, etc. He has a large list of video and documentary production and his works are shown around the world at many major festivals, TV stations and museums, like Cinema Paris, Hamburg Film Festival 2007, Docu-days Beirut, Video Brazil, Der Kunstwerk in Berlin and the Film Festival in Sydney and many others. 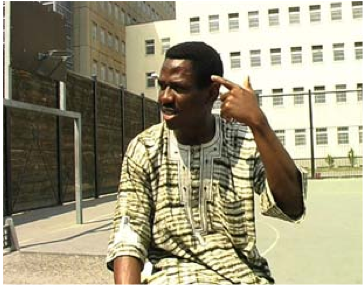 Ramadan was Senior Research Curator at the Third Guangzhou Triennial, China (2008). He is the founder of Chamber of Public Secrets – an independent institute; Chamber for Interventional Media – an institute for electronic, didactic and analytical art. Ramadan was given the Achievement award at the 11th Cairo Bi- ennial, 2008-09. Pijl, eds., Cambridge Scholars Press, Cambridge, UK, 2006.